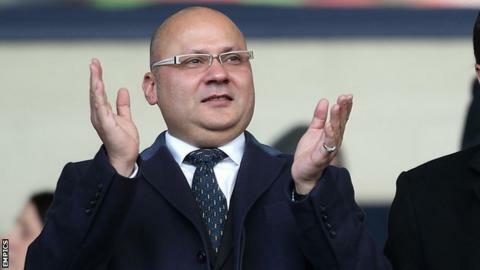 Birmingham City vice-president Peter Pannu has taken charge of the club after being appointed CEO of their Hong Kong-based holding company. The 49-year-old barrister has been appointed executive director, chief executive and managing director Birmingham International Holdings Ltd with immediate effect. Club president Carson Yeung is in Hong Kong facing money-laundering charges. And the owners of the Championship club also remain in financial trouble. Reuters reported on Wednesday that Birmingham International Holdings Ltd (BIHL), and its chairman Yeung, have been censured by the Hong Kong stock exchange for "breaching listing rules, according to a company filing". Having already been the man in day-to-day charge in England, as acting chairman of the football club, Pannu has now been put in charge of the parent company in Hong Kong as a safe pair of hands, in the wake of BIHL - and most of its current and former directors - being censured over their stock dealings. Blues currently stand 11th in the Championship table after Tuesday night's 2-1 home win over Bolton - only their second league victory since new manager Lee Clark took charge in the summer.